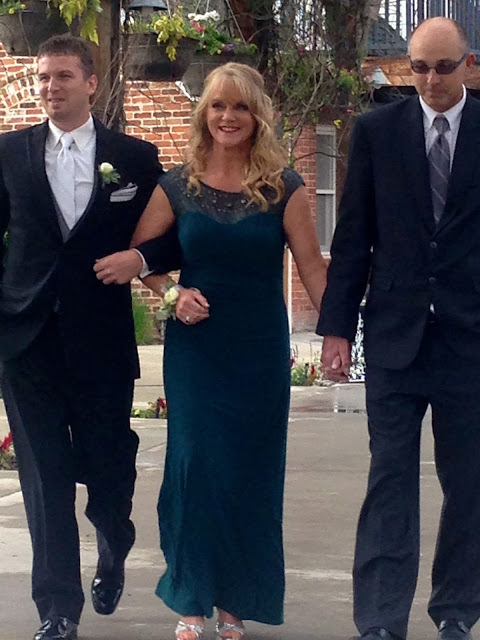 Last weekend my husband and I took another one of our 'Adventures' to the great state of Colorado to attend my niece's wedding. The wedding was held at Brookside Gardens in Berthoud, Colorado. It was about a fifteen hour drive for us, so we split the trip into two days, arriving on the day of the wedding. Because it was so far away, we thought we would just stay in the area for the next five days and make a vacation out of it. Those vacations posts will follow in the weeks to come. For now, I thought since this is a 'creative arts' blog and my usual posts revolve around artistic things like arts and crafts, fashion, interior design, and gardening; I would do a wedding post since all of those aspects are in a wedding….and especially this one! 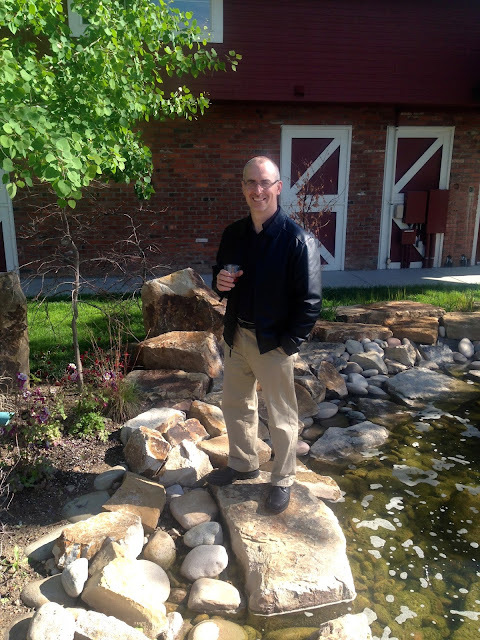 First off, the venue….gorgeous, gorgeous landscaped grounds with beautiful flowers, a water feature, and an indoor area for the reception that also could be opened up to the outside on warm days. The wedding ceremony was held outside under this lovely circular pergola that had hanging baskets and flower containers all around. When you enter the interior of the facility, in addition to a guest book, the bride and groom had a pretty table set up with this greeting and some bubbles to be used after the ceremony when the couple walked down the aisle. This is the dining area: beautiful white sheer fabric with white lights graced the ceilings and support beams. Tall white and green floral arrangements adorned each table. I love how they did the napkins by placing them inside the champagne flutes. It added an elegant secondary height to the table. The only problem was three of the four men at our table had no idea where their napkin was for they thought it was a decoration. We ladies just chuckled each time one gent asked "'Where did you get the napkin?" It was a guy thing, what can I say. The ladies had no problem figuring it out. 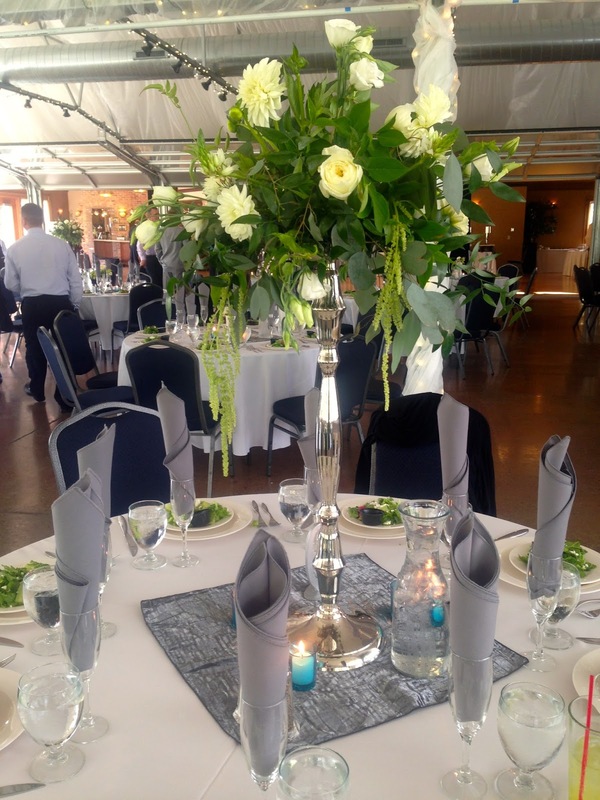 The wedding colors were a minty teal and grey, so the napkins and place mat were grey, and the bride brought in the teal color with pretty candles. This is the food buffet. Isn't that fruit arrangement to die for? So gorgeous! And I love the topiaries. 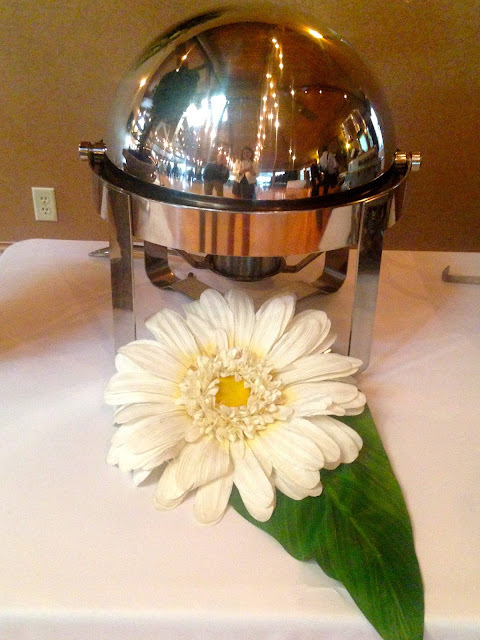 Large white flowers were placed in front of each silver chafing dish. 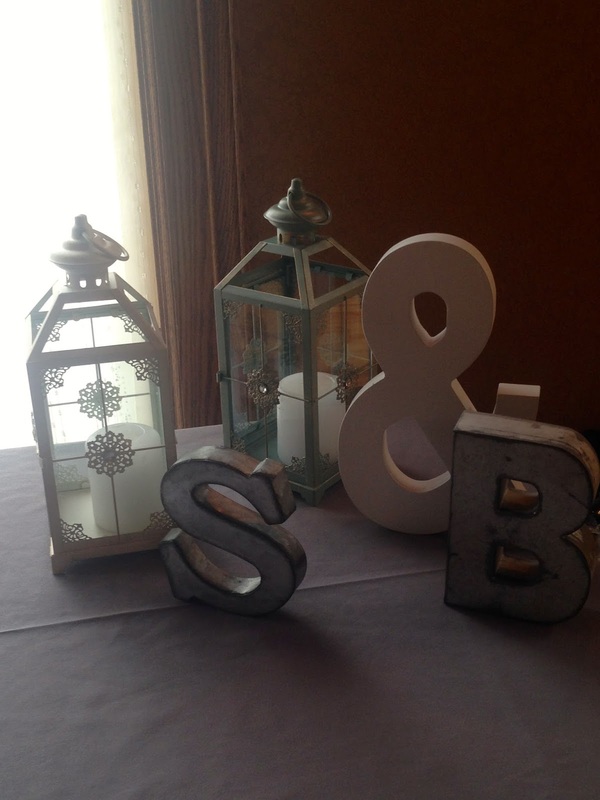 The bride and groom's initials in different materials, and sizes were placed at the end of one of the tables in the entrance. Two pretty white lanterns were added to finish out the vignette. 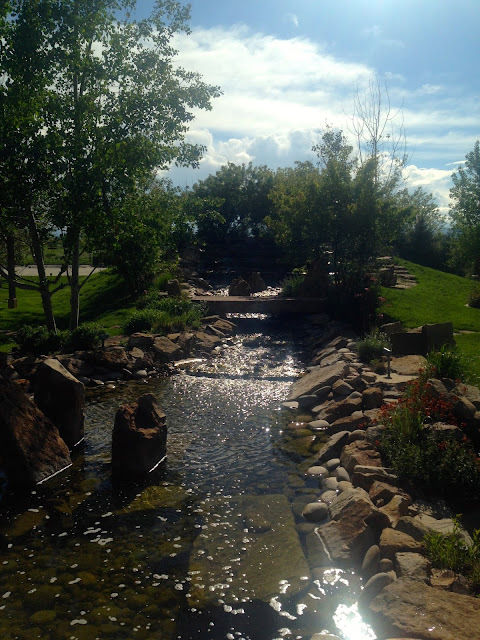 This is the water feature on the property. It has a small falls on the top. 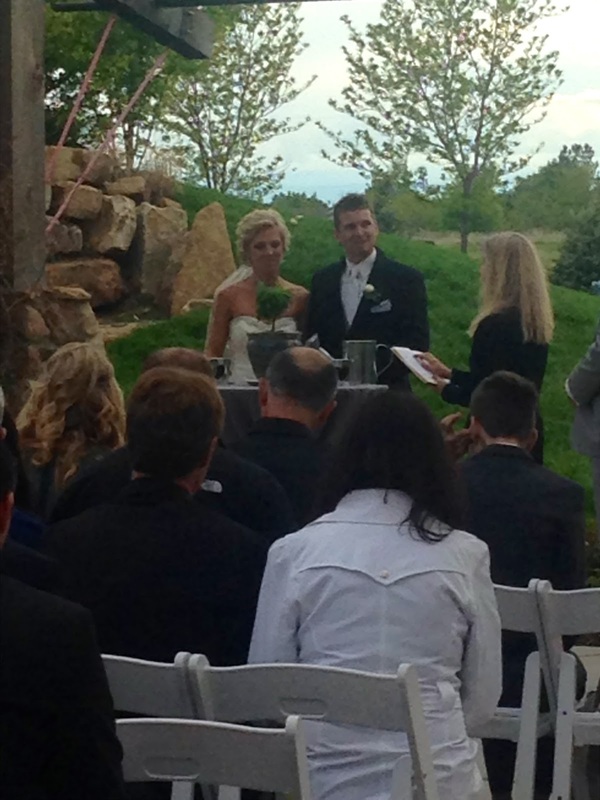 We could hear birds singing and a frog croaking during the ceremony. We tried to locate the frog to take his picture, but he was hiding pretty well because even though we could hear him, we could never see him. The wedding ceremony had some new elements that I have never seen before, but I really liked. One of them was that the groom walked all the parents and grandparents down the aisle himself instead of an usher doing the job. It was very sweet, and Robert must be in very good shape, for he would walk one set of parents down, seat them, then return to get the next set of parents, making a complete circle each time. In the picture below, Robert, the groom, is on the left, and the handsome couple are my brother Matthew and sister-in-law Sherry. Sherry, the mother-of-the-bride, wore a beautiful full-length dark teal gown with gems or rhinestones on the sheer portion along her neckline. Doesn't she look gorgeous? This next couple are brother and sister, and my nephew and niece: Andrew and Allison. 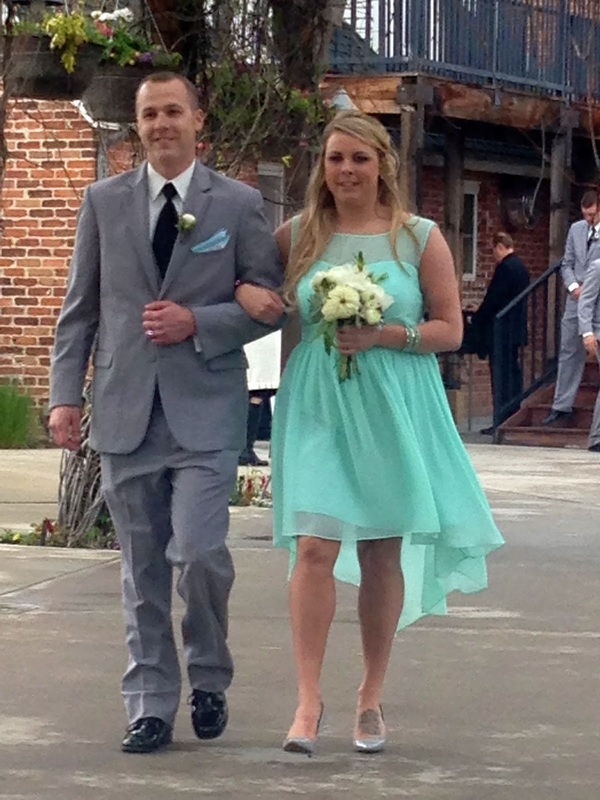 Here you can see the wedding colors, as the groomsman is wearing grey, and the lovely bridesmaid is in mint/teal. The bridesmaids carried a sweet little bouquet of white flowers. Their dresses had a sheer overlay, and a hi-low hem. 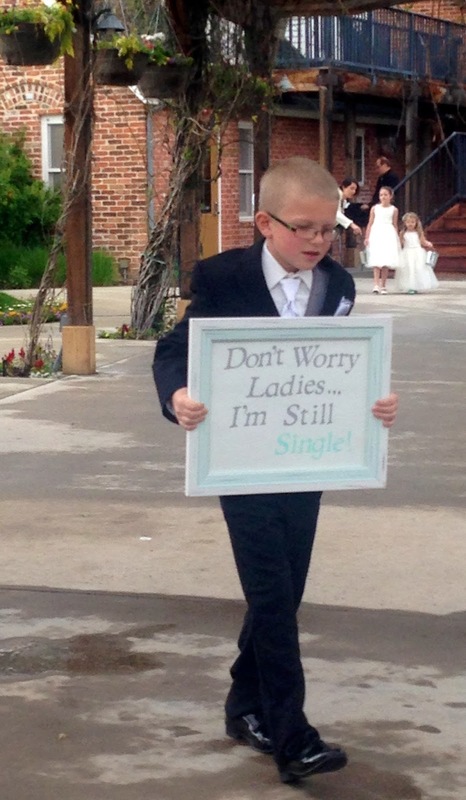 The ring bearer didn't carry a ring pillow, but he did carry this fun sign. So cute! 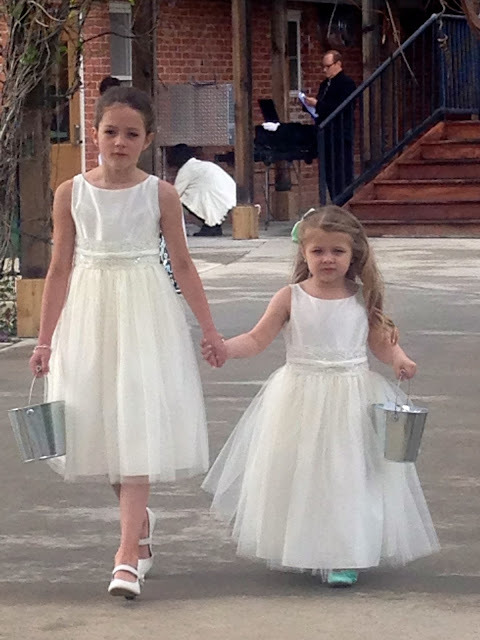 The sweet flower girls wore lovely white dresses. The shorter girl is Allison's daughter Ellamarie, my second niece. Isn't she just adorable? And here is the beautiful bride herself carrying one of the largest and prettiest bouquets of flowers I have ever seen! 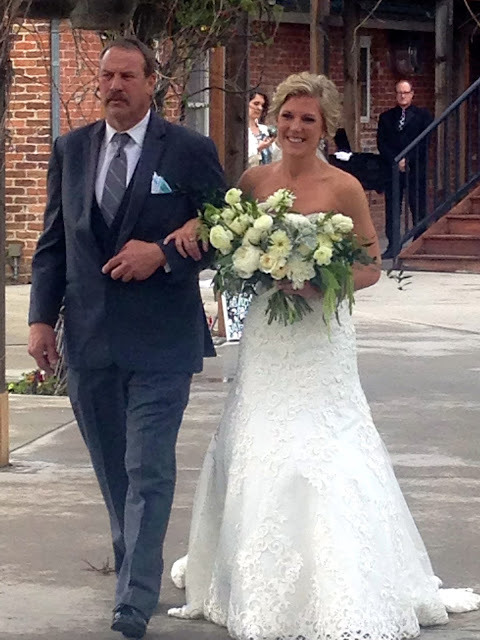 Her father walked her down the aisle. 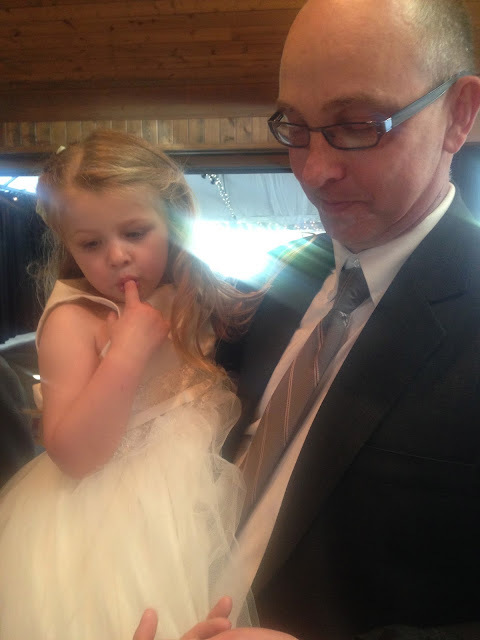 Her dress was lovely, very similar to the wedding dress I made for my own daughter. It had a lovely lace overlay with rhinestones at the top. The second element of this wedding that I had never seen before was the Tree Planting Ceremony. Instead of a unity candle, the bride and groom planted a tree using earth from different locations, one of them being the town in which they met. It was such a novel, and fun idea! 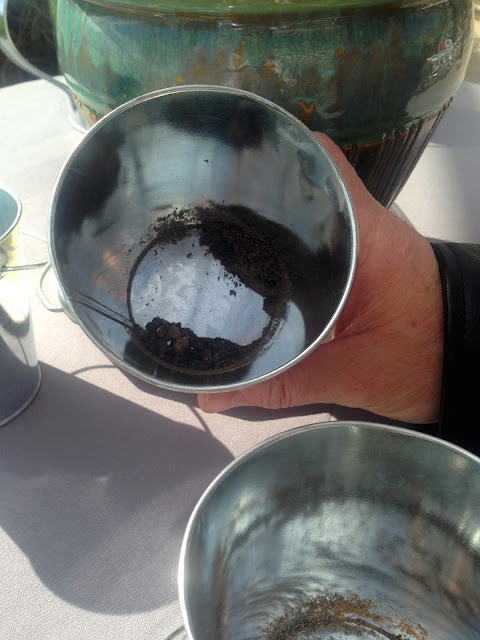 Pictured below is the cute Japanese Maple they planted together, along with four silver buckets filled with the earth of all the places that have been meaningful to them in their relationship. 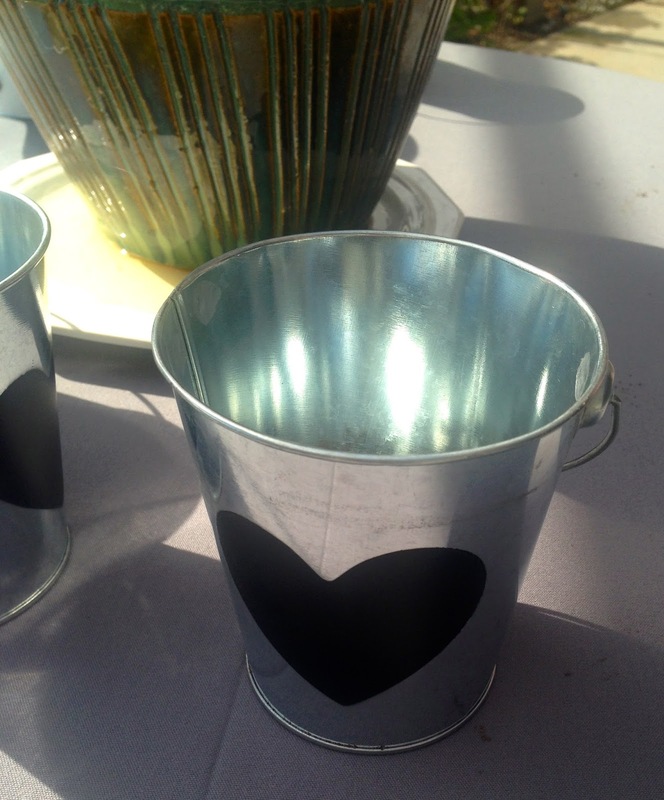 Each bucket had a black heart on the outside and was filled with different dirt from each location. After the ceremony, there was a cocktail hour as the bride and groom took a few wedding pictures. My husband and I decided to start searching for that frog again, (what can I say…we love little critters!) and I snapped this picture of him: If your wondering where I am in all these photographs, I decided to save those photos for a 'What to Wear to a Garden Wedding Fashion Post', which will be posted later this week. My brother Matthew holding his first and only grand baby so far. And now for the food…what would a wedding be without great food? I enjoyed the food on this menu so much that I actually started eating it before I photographed it…so excuse the horrible photo! I know, it is totally not 'blog worthy'. :) But, if anything, it goes to show you how good it was. In addition to delicious hors d'oeuvres of crab cakes and hummus on a little bread slice, the rest of the meal consisted of a red meat that no one at my table could figure out what it was, but we all agreed it was absolutely delicious, Mediterranean chicken, mashed potatoes, asparagus, and a roll and fruit assortment. They were all delicious, and not crumb was left on my plate when I finished eating, but our entire table agreed that the chocolate covered strawberries were our favorite! 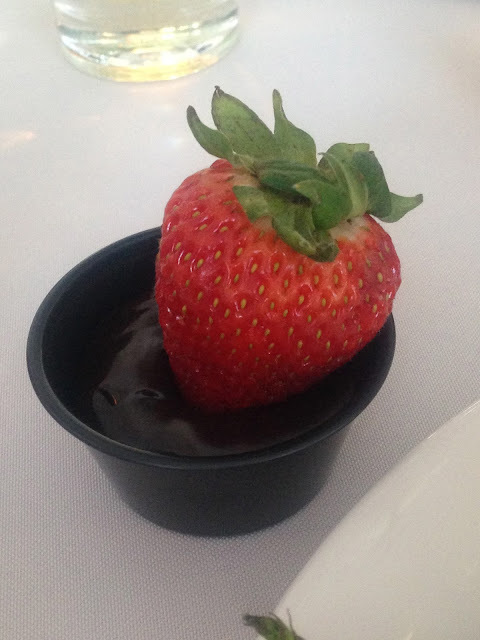 The chocolate sauce was so delicious! The bridesmaids placed their arrangements in these crystal vases when the ceremony was over to adorn the head table. Here is a far-away shot of the head table. This picture was taken during the cocktail hour when everyone was outside enjoying the sunshine before dinner. 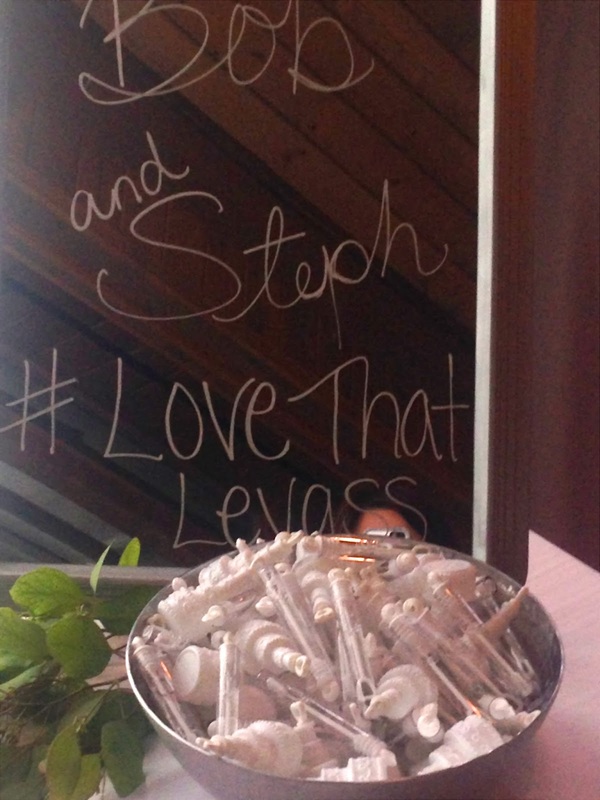 Notice the 'garage doors' behind the groomsman table? Those are the doors that can be opened in warmer weather to let cool air into the facility. 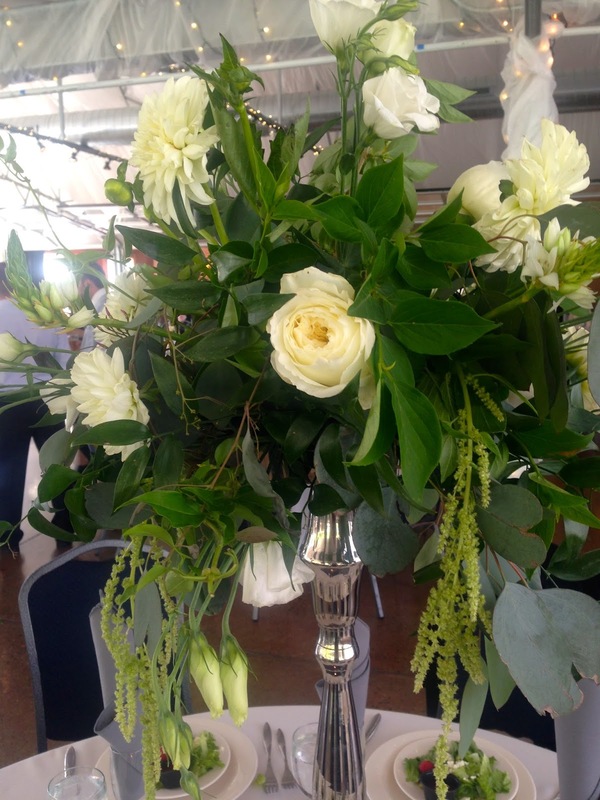 Well I can't leave you without including a few close ups of the table arrangements. You all know how much I love flowers and special event decorating, and I really loved this table setting. I like table arrangements that are either very high or very low so that they don't obstruct views. I absolutely love the elegance of this table setting. 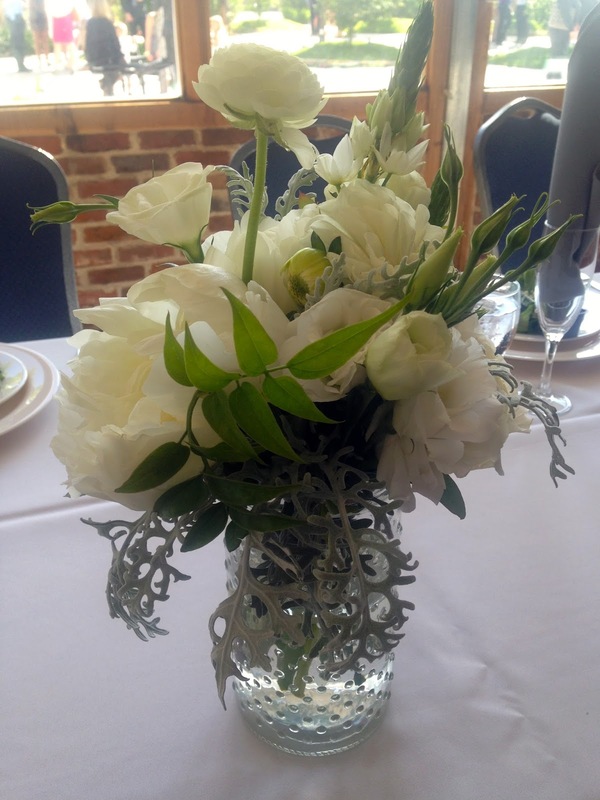 The floral arrangement is breath-taking, and the combination of the silver with the crystal is exquisite! The muted grey tones, along with just a touch of color from the teal candles is just gorgeous and so elegant. Wow, Amy - what a beautiful wedding! Our daughter was married in Colorado, also. They chose the teensy little chapel at Garden of the Gods, and it was beautiful. Thanks for sharing - where's a pic of you in YOUR wedding attire??? Hugs! Amy this is awesome. We were there, you have a picture of my backside in the white coat. I was mad at myself for not taking more pictures, I am so happy you did. Thank you for sharing, you captured it exquisitely! What a beautiful wedding indeed. I love the sign that says don't worry ladies I'm still single. How precious is that?! Such beautiful wedding photos! Love the tree planting! I bet it was just magical hearing birds sing and frogs in the background! What a beautiful wedding! I love the ring bearers sign, so adorable!